The updated 4th Edition of THE ENTREPRENEUR'S GUIDE TO BUSINESS LAW takes you through the various stages of starting a business--from start-up and growth to an initial public offering--while highlighting the legal preparations and pitfalls that go along with them. 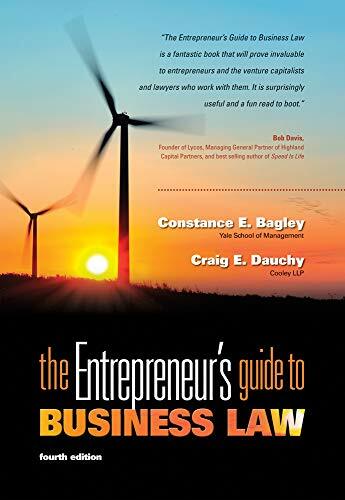 Packed with practical strategies for managing legal issues, the text presents the essentials on leaving your job, competing with a former employer, contract law, and bankruptcy, as well as on the most current issues like clean energy, e-commerce, and the effects of the recent recession on entrepreneurship. Clean Energy: For readers who are interested in creating green collar jobs, updates throughout the text reflect sweeping changes in the laws surrounding photovoltaics and clean energy technology in general. Boards of Directors: Examine up-to-the minute, hot issues such as recent litigation involving Citigroup in which the independent directors were not held liable for failing to anticipate the crash of the subprime mortgage market. Employment, Covenants, and Discrimination: Readers are introduced to the myriad legal issues in employment today, such as covenants not to compete, independent contractor status, actionable activities under Title VII, governmental bodies as sources of public policy, and substance abuse in employment discrimination. The text also delves into the latest ADA amendments, new federal minimum wage guidelines, changes to the Vietnam Era Veteran's Readjustment Assistance Acts, the Patient Protection and Affordable Care Act of 2010, and even the potential legal affects of social networking sites. Many New "From the Trenches": Illustrate the most current issues with new boxed features about the Uniform Electronics Act, recent litigation surrounding the contraceptive Yaz, California's new Song-Beverly Act, a Nissan case involving the Magnuson-Moss Warranty Act, the Sarbanes-Oxley Act, and others. Bankruptcy: Demonstrate the dangers and complexities of creditors' rights and bankruptcy with the Supreme Court's treatment of nonexclusive patent licenses where the debtor company is the licensee. Boxed Features: Found throughout the book, these "From the Trenches" boxes include fascinating examples from successful entrepreneurs and venture capitalists. Many based on actual cases, they help users avoid the traps that others failed to recognize. "Putting it into Practice" Example: Based on a hypothetical, clean-technology company, this example spans the entire text and follows an entrepreneur through the phases of starting a new venture. As they practice spotting legal issues and outlining solutions in this example, readers grow more prepared for a future in business ownership. "Getting It in Writing" Section: Users get the practice they need preparing essential legal documents with the samples provided in this feature, such as a venture capital term sheet and an independent contractor services agreement. Exhibits: Exposure to key concepts and terms in these exhibits placed throughout the text helps users recognize and better understand the most critical legal issues. Constance E. Bagley is a Senior Research Fellow at Yale School of Management, where she was formerly Professor in the Practice of Law and Management and a Senior Research Scholar at Yale Law School. Previously, she was an Associate Professor at Harvard Business School, a Senior Lecturer in Law and Management at the Stanford University Graduate School of Business, and a corporate securities partner at Bingham McCutchen LLP. Dr. Bagley has published articles in numerous professional journals, including the Academy of Management Review, the Harvard Business Law Review, the Harvard Journal of Law and Technology, the American Business Law Journal, the Stanford Journal of Law, Business & Finance, the University of Pennsylvania Journal of Business Law, the Duke Journal of Comparative and International Law, and the Cornell Journal of Public Policy. She has coauthored THE ENTREPRENEUR'S GUIDE TO LAW AND STRATEGY and authored WINNING LEGALLY: HOW MANAGERS CAN USE THE LAW TO CREATE VALUE, MARSHAL RESOURCES, AND MANAGE RISK. She has also contributed chapters to THE OXFORD HANDBOOK ON DYNAMIC CAPABILITIES and GENERAL COUNSEL IN THE 21ST CENTURY: CHALLENGES AND OPPORTUNITIES. She recently coauthored an article for Harvard Business Review (https://hbr.org/2017/12/how-boards-can-reduce-corporate-misbehavior). Dr. Bagley received her JD from Harvard Law School and her AB with Honors and Distinction from Stanford University. She received an honorary doctorate in economics from Lund University in Sweden in 2011. She is a member of the Bar of New York and of the Bar of California (inactive). Dr. Bagley has also taught at the University of Connecticut School of Business and its School of Law. She is the business school coeditor of eshiplaw.org and CEO of Bagley Strategic Consulting Group LLC. Bagley, Constance E.; Dauchy, Craig E.
Bagley Constance E.; Dauchy Craig E.
Dauchy, Craig E.; Bagley, Constance E.